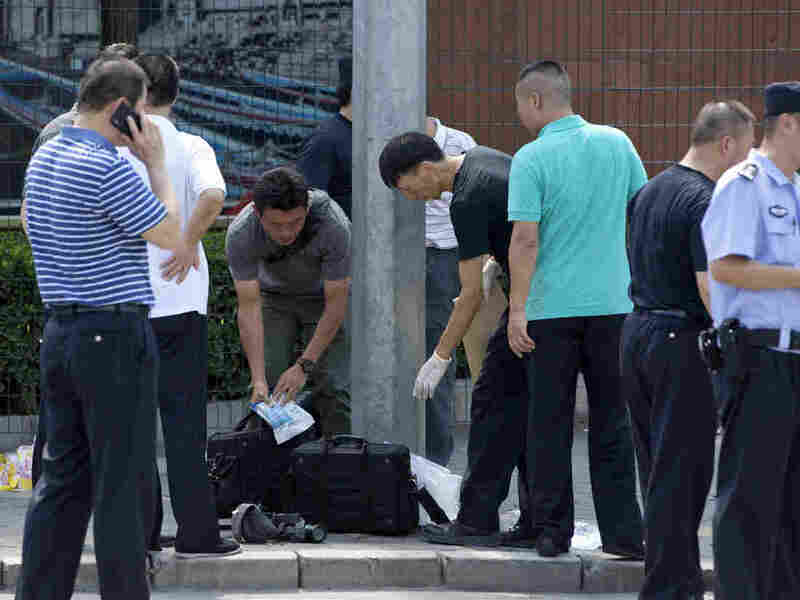 Small Bomb Detonated Near U.S. Embassy In Beijing Police apprehended a 26-year-old man, whom they say detonated a small, homemade device. There were no reports of injuries other than the suspect. Chinese officials work near the site of a reported blast just south of the U.S. Embassy in Beijing, on Thursday. Chinese police quoted by The South China Morning Post said a small, homemade device described as similar to a firework was detonated by a 26-year-old man who injured his hand in the explosion. Authorities identified the suspect by his surname, Jiang, and said he is from Tongliao in the Chinese region of Inner Mongolia. A U.S. Embassy spokesman confirmed: "There was an explosion at approximately 1 pm today on the street outside the South East corner of the Embassy compound. According to the Embassy's Regional Security Officer, there was one individual who detonated a bomb. Other than the bomber, no other people were injured and there was no damage to embassy property. The local police responded." One witness, a 19-year-old student who only gave his surname, Li, told NPR that he was in line outside the embassy when a blast — comparable to a large firework — went off a few dozen feet from where he stood. Li said he was caught up in the crowd as it surged away from the explosion. Outside the embassy's gate, what appeared to be a bloodstain was visible near the blast site. Despite the explosion, police did not cordon off the area around the embassy, as sometimes happens when there are street protests or concerns of terrorist attacks. A spokesman for China's Foreign Ministry, Geng Shuang, said the explosion was an isolated incident and that police were handling it, according to the Post. In another incident, state-run Global Times said police had detained a woman who sprayed gasoline on herself in an apparent attempt to self-immolate. It was not immediately known whether the two incidents were related. Roughly an hour after the explosion, crowds of visa applicants were filing in and out of the embassy. The U.S. and China are in the midst of a heated trade dispute, but America remains a popular destination for Chinese tourists. The U.S. Embassy is located in an embassy district in the city's northeast adjacent to the Indian Embassy. Journalist Aditya Raj Kaul tweeted that he had spoken to India's ambassador to China, Gautam Bambawale, who said there were "no fatalities" and described it as "a low intensity blast." "All Indians are safe," Bambawale reportedly said.